Reuse of materials is an efficient way to reduce the use of of energy intensive materials. Instead of discarding tonnes and tonnes of wastes from the factories and homes, some part of it could be used for creative construction. This will help in achieving “Waste reduction” and help us move one step forward towards the sustainable environment. Our prime goal is to, “Sustain the Sustainable”. In this article, we are going to discuss some of the examples that I came across while conducting a research on the Utilization of Waste Materials for Innovative constructions. Bottle houses sounds weird, isn’t it? When I read about the construction of Bottle Houses, i was really amazed with the thought of utilising discarded glass bottles for such an innovative purpose. A new distinct style of constructing walls with glass bottles of 1L capacity as masonry units and uses cement, stucco, plaster, adobe for the binding purposes resulting in the construction of beautiful stained glass like wall. The compound walls have been constructed using discarded rubber tyres of the cars. The grooves in the tyres provide the necessary adhesion. In this case, the rubber tyres serve as masonry units and cement and adobe are used for the binding purposes. In this case, aesthetic factor is a little neglected but I would say, the tyre compound wall itself would look so ornamented and out of the world. 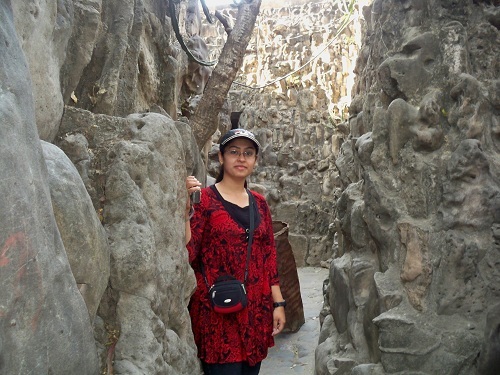 Chandigarh is a beautifully planned city by Le Corbusier. 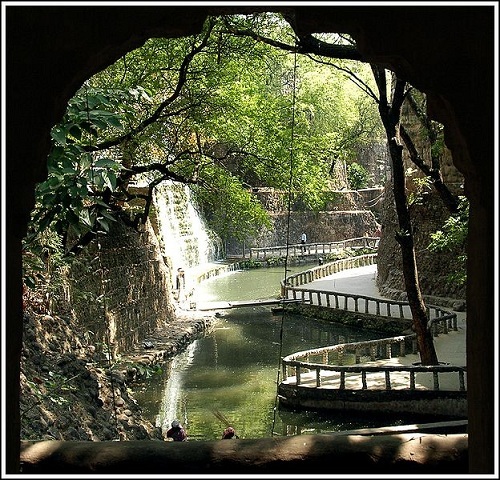 The Rock Garden in Chandigarh has been designed by using natural and recycled or waste materials. 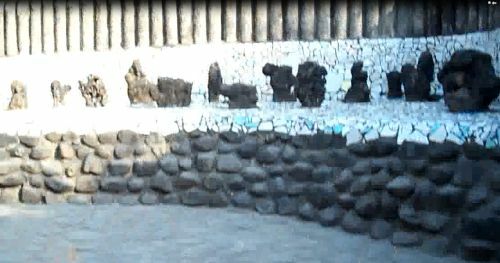 Various shapes and sizes of the rocks have been used for the steps and the walls. The defective sockets and switchboards that have been discarded from the factory have been used for cladding purposes. Broken tiles have been used for the cladding of floors and side walls. This entry was posted by Benzu JK on August 21, 2010, 5:27 am and is filed under Sustainable Design. You can follow any responses to this entry through RSS 2.0. 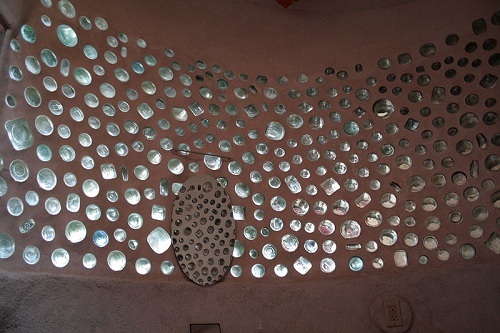 I love the beautiful stained glass like wall in the bottle house. Are they kept in-tact or is it just the bottom of the glass bottles that is used as a decoration. The bottles are kept intact. Different shaded and sizes of bottles are used in the construction which gives a unique appeal to the bottle house. I always thought the various odds and ends that are left over at the end of a construction project should be recycled into something useful, but could never think of what. Glad someone has. Inventing various different methods for the reuse of discarded materials is the need of our time. It is necessary that we reduce unnecessary consumption of energy intensive materials wherever possible. Reduce and reuse are the key elements of attaining a sustainable environment. Those designs and works are just so wonderful that I’m left speechless. They are really good and I think the ones who made those should be proud and I think they already are. Artistic and nature loving at the same time. Two Thumbs up for you guys!!! Keep it up! That is a good design and idea. Through that design we can also recycle those bottles. instead of just throwing them we can use them in designing art. I have a land of around 4800 Sq. Ft. at my native taluka place. I want this land to be protected with compound wall, but with less expenses & also want to rent it out to store any material (Agriculture products like onions, or as a godown for any type of material). Please suggest me idea of reusable material that can be used for this purpose & also shall be cheaper than the conventional methods like brick & concrete material.